Looking for resources? Try 2-1-1! 2-1-1 Tehama is the comprehensive information and referral service for Tehama County that connects callers and website users with information about local health and human services available ranging from basic needs to recreation (many of which are free or low cost). 2-1-1 calls are answered by trained Call Specialists who are available 24 hours a day, seven days a week. 2-1-1 Tehama also provides incident specific information in coordination with local emergency services during times of disaster, including road closures and shelters. 2-1-1 Tehama launched on 2-1-1 Day (2/11) in 2014. As a local, private, non-profit organization with a 501(c)3 status, 2-1-1 operates thanks to local grants and donations. Be sure to check out our Funders – they make 2-1-1 possible in our community! 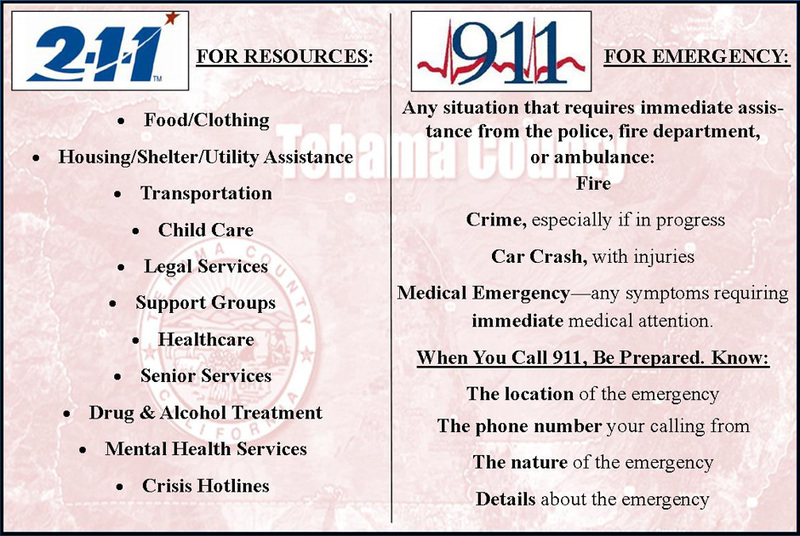 2-1-1 has been designated by the Federal Communication Commission for community information and referral services, just as 9-1-1 is set aside for emergency services. 2-1-1 utilizes both bilingual Call Specialists and a phone based translation service to offer 2-1-1 information and referral in over 150 languages. How does one access 2-1-1? You can connect with a 2-1-1 Tehama Call Specialist by calling 2-1-1 or by texting your zip code to 898211 (txt211). If you are in another county, call 866-963-8182. You can also search the 2-1-1 resource database online here on www.211tehama.org. To find toll free numbers for 2-1-1 services across the country, visit www.211.org. Do you have more questions about 2-1-1 Tehama? Email info@211norcal.org, or call United Way of Northern California at 530-241-7521.